Mary Ann Murdoch is a professor of Humanities, Film, and Yoga Philosophy. She has a bachelor’s degree in Journalism from the University of South Florida and a master’s degree in Liberal Studies (Humanities) from Rollins College. She worked as a journalist — writer, editor, and photographer —for 25-plus years. Her career also has included work as a rock music critic, film critic, and radio disc jockey. She is a published and award-winning fiction author and poet. 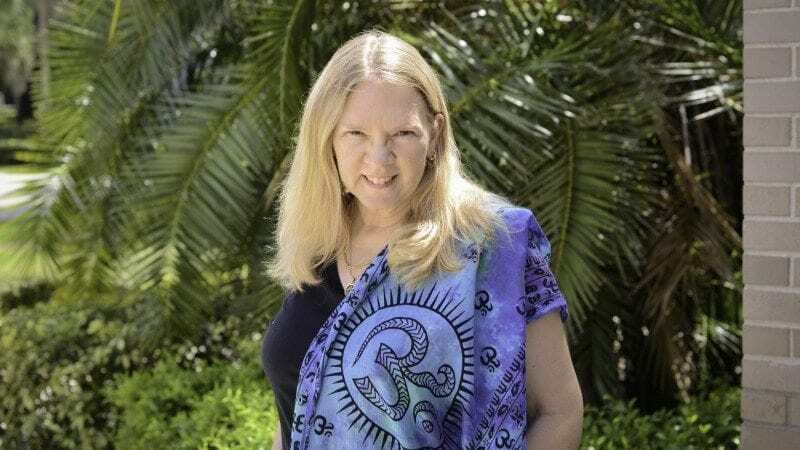 She has traveled extensively to all six major continents: North America (all 50 states, plus Canada and Mexico); multiple trips throughout Europe; Australia; South America; a journey to Africa in 2011 to teach in Uganda; and a trek to Asia when she visited India in 2018. Murdoch is a longtime yoga practitioner and a Registered Yoga Teacher (RYT200). She teaches yoga at a Lakeland studio and does presentations and workshops on yoga and yogic philosophy. She teaches yoga for Polk State’s Wellness Program. Murdoch embraces Eastern wisdom, including Buddhism and Taoism, and proudly proclaims herself a freethinker. Her award-winning photos have been on view at several Polk State gallery exhibits, including winning Best of Show in the 2018 “Capturing Cultures” exhibit. She has a book of short fiction and poetry that was published in 2016. Additionally, Polk State awarded her the Thelma Raley Endowed Teaching Chair in August 2016. She currently is a doctoral candidate, pursuing her Doctor of Education degree (Ed.D.) at Florida Southern College. Murdoch has been teaching Humanities and Film at Polk State since 2009. She enjoys sharing and connecting with students and the College community; the challenge of making classes relevant and engaging; and expresses gratitude at being a guide on the path of knowledge, discovery, and creativity.